...I got myself a Japanese watch. In 1960's when I was a kid starting 1st grade at school, my dad bought me my first watch - a manually wound Citizen. Importation of Citizen watches from Japan had only just started, and the local AD told us I got the first Citizen watch in our town. That Citizen served me well for almost two decades, until I accidentally smashed it hard against a rock during a military exercise. It was time to get a new watch. By that time, I had already spent some time in Switzerland working as "student praktikant", and got the hankering after Swiss watches. I have only bought Swiss watches ever since. Until today, that is. 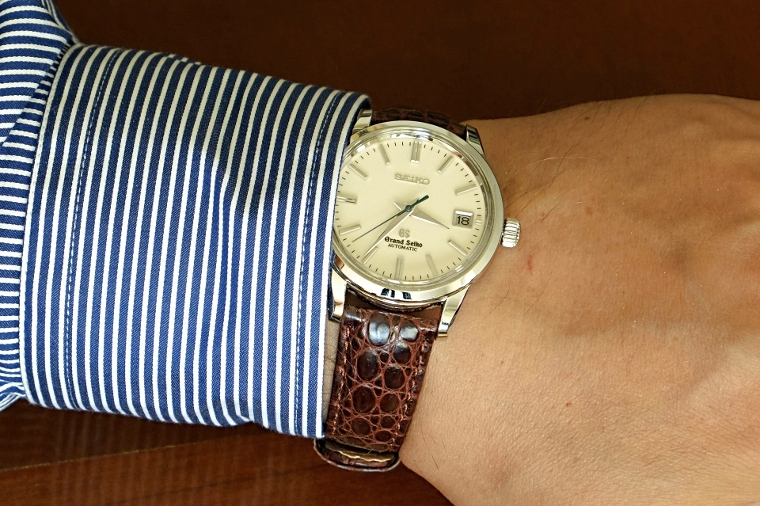 Yesterday I was in a local watch shop to get a new NATO strap for my Eterna KonTiki. I noticed they had some Grand Seikos on display, and the sales guy told they had just started to represent Grand Seiko as the first and only AD in Finland. I was not going to buy any new watches, but had a brief look at the Grand Seikos just because I had never examined them closer before. Rather nicely made, I thought, and as the saying goes, one of them really smiled at me. Anyway, I went home determined not to buy a new watch no matter how nice it looked. The end result was that once again an AD told me that I was the first client buy a Japanese watch from them.